The Hisense RQ560N4WC1 A+ Fridge Freezer with it's minimalist design helps to match your kitchen beautifully and comes with a stylish stainless steel-look, has a perfect quad-divisional structure, ergonomic recessed handles, and an elegantly crafted electronic touch LED control display. HiSense UK 5 Year Parts & Labour Guarantee Included. 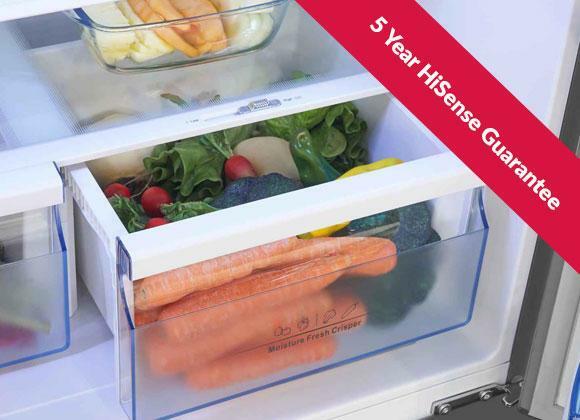 ‘Multi Air Flow’ helps to keep food at its optimal temperature by circulating cold air around the fridge freezer. Inside the freezer, you’ll also find a twist tray ice cube maker, giving you access to ice cubes at the flick of a wrist. As we are a Hisense retailer we can offer you the best advice, installation and after care service than national retailers. Our installation service covers the whole of Greater Manchester and also many parts of Lancashire. Our prices are constantly monitored to ensure that we are as competitive as national retailers. This Hisense RQ560N4WC1 is also available with a bespoke white glove delivery and installation service. Ask in store for further details. I have only had the fridge for 4 weeks so hard to say but I am happy with it so far. I really like the 2 doors on both levels so you don't need to open both to get something out. I also like the fact the freezer can have 2 different temperatures: one for each side. Like the one open compartment in the freezer for the things you want to get to quickly. 4 doors a great plus for us Also runs very Quiet, Visible Water Level on the Dispenser Premium product at a budget price. We bought this fridge freezer about a month ago and was installed yesterday. We are very pleased with its appearance and its functional features. Bought in October 2017 and very pleased with the purchase. Great design, looks amazing, quiet and plenty of space. we had a new kitchen installed and a week before our fridge freezer failed , we looked on line and the which report showed this to be the best and we certainly agree it is spacious and my only concern is the door open alarm i feel it should be louder but best buy in years. On purchasing this we were able to get rid of our old chest freezer. No issues with fridge. Well built and very quiet Only gripe is fridge doors sometimes clash when closing, unless there's a certain way they should be closed. Fantastic. 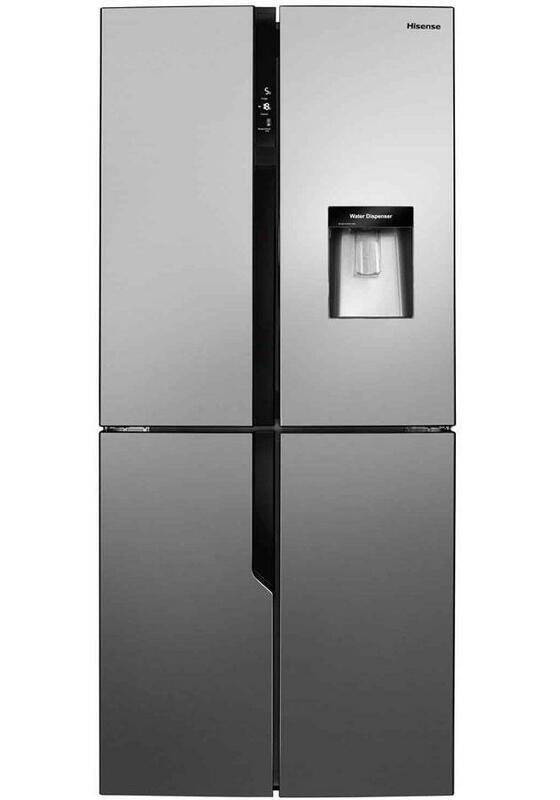 Frost free plenty of space, water cooler does exactly what a fridge freezer should do. Great American style fridge freezer, lovely design and more spacious than expected. Looks perfect in our new home. First heard of Hisense due to them being a main sponsor during the football euro's so i may have been a little skeptical buying blind. This fridge freezer is the best! It holds so much, the crisper drawers are worth there weight in gold they stop the food from getting moisture to them fantastic price for what you get. The product is very good and I would recommend this to anyone, just make sure you measure your doors correctly. We needed a fridge/freezer that was smaller than most american style products. This product is great value for money, looks amazing and works like a charm.